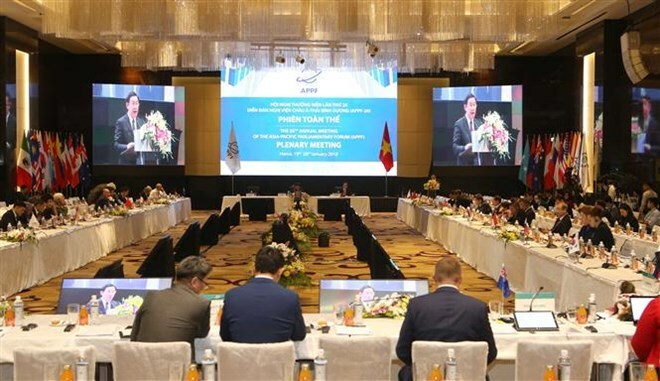 Hanoi (VNA) – Member parliaments of the Asia-Pacific Parliamentary Forum (APPF) have played a significant role in fostering regional connectivity and cooperation to propel economic-trade development and integration. The issue, among the topics put forth by the host Vietnam in the agenda of the 26th Annual Meeting of the Asia-Pacific Parliamentary Forum (APPF-26) were applauded by delegations from the participating members and considered as a goal for the APPF’s future affairs. It was the highlight of its second plenary session, with 11 related resolutions submitted. For more than half a century, Asia–Pacific has thrived to become a driver of the global economic growth, largely thanks to its efforts to capitalise on extensive economic connectivity and advantages of micro-, small- and medium-sized enterprises (MSMEs) networks. In this regard, law-making bodies can facilitate positive changes through policies in each nation and through bilateral and multilateral legal frameworks agreed among them. Parliamentary diplomacy complements traditional diplomacy as a means of building mutual trust and promoting the exchange of information that is not normally obtained through official diplomatic channels. The Asia-Pacific region accounts for approximately 40 percent of the world’s population, approximately 60 percent of its gross domestic product and 50 percent of global trade. Trade and investment have generated unprecedented prosperity in Asia-Pacific, but there remained barriers, such as increasing protectionism and differing views on integration and globalisation. Concerted efforts to boost trade and economic integration in the region have produced important outcomes, particularly the signing and implementation of bilateral and multilateral free trade agreements (FTAs). For example, ASEAN, of which APPF members Vietnam, Laos, Cambodia, Malaysia, Singapore, Thailand, and the Philippines are also members, has signed FTAs with several Asia-Pacific partners, including China, Japan, the Republic of Korea, Australia and New Zealand. “We should take concrete actions to improve connectivity, similar to APEC’s and ASEAN’s initiative, focusing on three priorities: infrastructure, human and institutions. 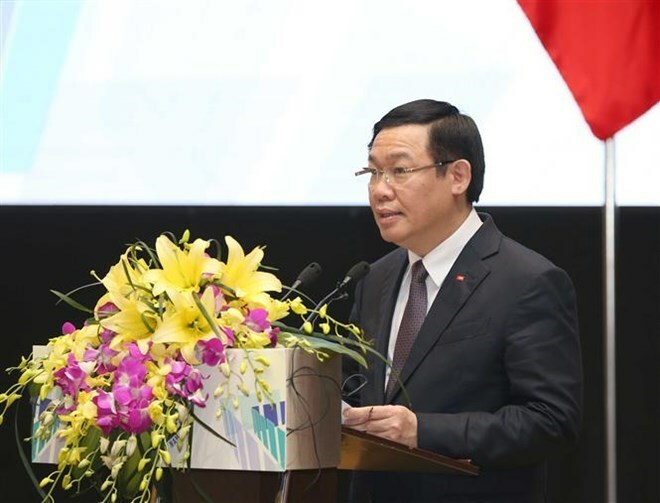 Parliaments play an important part in this process as national legislative bodies,” stated Vietnamese Deputy Prime Minister Vuong Dinh Hue at the second plenary session of the APPF-26. Aware of the importance of economic integration, the Vietnamese delegation brought to the debate a resolution on the role of parliaments in the field. Vietnam encouraged parliaments of APPF member states to implement innovative practices that improve time and cost efficiency for international trade and investment, including streamlining customs procedures and reducing tariff and non-tariff barriers as well as improving the business climate in each member economy. The country backed endeavours to strengthen the capacity, engagement and mechanisms for parliamentary oversight of international trade and investment as a key instrument for better economic integration in Asia-Pacific. Masazumi Gotoda, member of the House of Representatives (lower house) at the National Diet of Japan, said parliaments should fulfill their role of inspection to ensure the effective implementation of policies for economic growth related to currency and economic cooperation. He also suggested building a high-quality workforce for the digital age, and empowering women, noting that fair competition is necessary for free trade. In its resolution on promoting regional economic cooperation and integration through FTAs, the Canadian delegation pushed for the encouragement of public investment and policies that help create public-private partnerships related to the implementation of trade agreements, regarding infrastructure, logistics, digitisation, innovation, education and skills-training. Canada supported the entry into force of the WTO’s Trade Facilitation Agreement, and encouraged APPF member states to undertake measures to implement the agreement and those who are yet to ratify the agreement to do so. MSMEs are important driving forces of Asia-Pacific economies due to their contributions to employment, innovation and poverty alleviation. Trade performed through digital platforms represents a significant opportunity to make MSMEs a part of international trade. In other words, new technologies reduce MSMEs’ trade costs, allowing these companies to be able to compete better in the global market. Based on this context, parliaments have a final say in building a system of regulations, policies and principles conducive to market access and withdrawal, fair competition, connected supply-demand sources and improved state governance capacities. Parliamentarians at the APPF-26 were involved in the consideration of the best practices in the debate of green MSMEs, improving MSMEs’ accessibility of finance, technology and facilitating their access to FTAs and global value chains. Nurhayati Ali Assegaf, Chairperson of the Indonesian Committee of Inter-Parliamentary Cooperation, suggested the APPF members improve the role of MSMEs and other economic sectors for extensive and equal economic integration. Malaysian Senator Khairudin E.S. Abd Samad said it is important to continue promoting start-ups and innovative MSMEs, facilitating their participation in the global value chain and improving the business climate in the digital age. He urged the APPF member states to embrace new technologies and innovation to bring MSMEs to the international market, with a belief that good networking and cooperation among the APPF parliaments in developing e-commerce will reduce gaps in the region, particularly in security matters and data flow. Chilean parliamentarians proposed a resolution on supporting MSMEs in the digital era, which called for the reinforcement of the commitment adopted in the declaration of the 25th APEC Economic Leaders’ Meeting in Vietnam’s central Da Nang city to reinforce MSMEs ability to compete in international markets and to participate in global value chains through better access to the internet and digital infrastructure. Chile urged Asia-Pacific parliaments and governments to create a legal and entrepreneurial atmosphere favourable for the development of electronic commerce, providing certainties in regard to legal responsibility, data protection and copyright. The APPF-26 Resolution on Promoting Economic Growth and Free Trade asked the member states to strengthen their partnership based on the principles of equality, mutual benefits, and shared responsibility; to seek efficient schemes for regional economic integration and measures to address challenges facing the process; and to study developing integration drivers, such as transport, energy, digital infrastructure, and science –technology, as a basis for further integration. The resolution, sponsored by the Republic of Korea, Japan and Russia and adopted by all participating delegations, called upon member states to implement the “APEC Action Agenda on Advancing Economic, Financial, and Social Inclusion”, which was endorsed at the 25th APEC Economic Leaders’ Meeting last year. The action agenda aims to build an Asia-Pacific community which shares the benefits of free trade in a more inclusive, accessible and sustainable manner. The resolution also urged the APPF member states to put forth measures to build an innovative ecosystem through a legal framework favourable for strengthening the competitiveness of MSMEs in the digital era and to expand the scope of support to help the group engage deeper in global value chains. The APPF-26 final resolution on the Role of Parliaments in Promoting Seamless Regional Economic Integration, sponsored by Canada, Chile, Mexico, New Zealand and Vietnam, stressed the commitment to further promoting free and open trade in Asia-Pacific by supporting a ruled-based, free, open, fair, transparent and inclusive multilateral trading system. It supported the establishment of the Free Trade Area of the Asia-Pacific (FTAAP) via possible pathways, including the Comprehensive and Progressive Agreement for Trans-Pacific Partnership (CPTPP), Regional Comprehensive Economic Partnership (RCEP) and Pacific Alliance (PA), and FTAs between ASEAN and trading partners. It endorsed the pursuit of policy strategies to increase MSMEs’ innovation capacity, especially for women and youth-led businesses, and the promotion of development and utilisation of e-commerce in Asia-Pacific by strengthening a favourable, transparent and stable legal environment and policies for global economic integration. Founded in Tokyo, Japan in 1993, the APPF has 27 members, namely Australia, Cambodia, Canada, China, Chile, Colombia, Costa Rica, Ecuador, Fiji, Indonesia, Japan, Laos, Malaysia, the Marshall Islands, Mexico, Micronesia, Mongolia, New Zealand, Papua New Guinea, Peru, the Philippines, the Republic of Korea, Russia, Singapore, Thailand, the US and Vietnam.